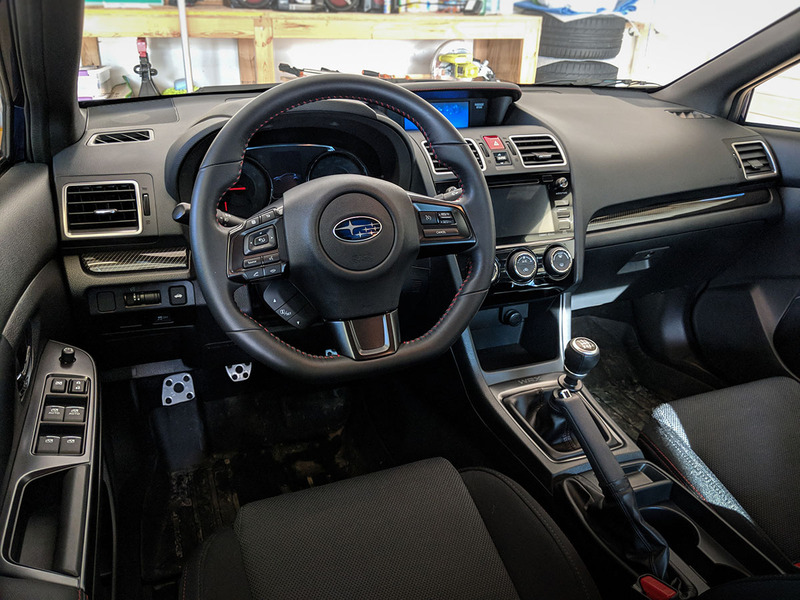 For 2018, Subaru made a number of much needed updates to the interior of the WRX: softer touch materials, gunmetal painted accents, upgraded leather surfaces to name a few. However, there were cost-cutting measures in a few places as well. One of the most obvious is the emergency brake handle. Being a manual transmission, the e-brake is one of the items I touch most often when driving the car. Unfortunately, the OEM rubber and chrome e-brake handle and button leave a lot to be desired. 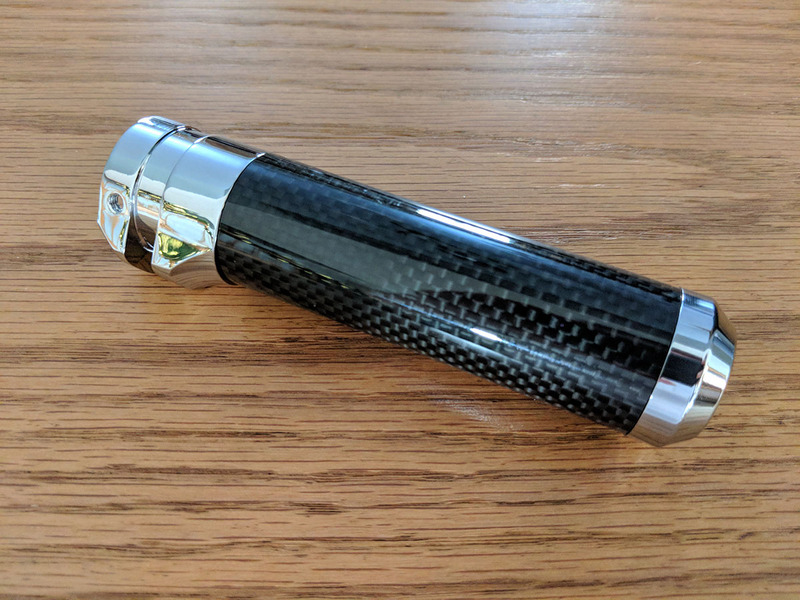 As a result, a replacement carbon fiber handle and button were high on my Christmas list this year. Well, Santa delivered and both the handle and a Perrin Drift Button were under the Christmas tree Monday morning! Looking over the handle itself, it’s a suprisingly quality item for the price! While the metal finishes are actually just chrome painted plastic, the carbon inlay looks to be very real and matches the OEM carbon interior accents perfectly. Installation is super straightforward (Subispeed has a great how-to video here), and can be done in a few minutes with nothing more than a heat gun and some upper body strength. Just heat up the OEM handle and twist/pull it off! The replacement handle slides on right on and can be fixed into position with the provided lock screws/allen key. For a button, I chose the Perrin Drift Button for its gunmetal anodized finish. The button itself is high quality and comes with a pre-installed rubber o-ring for a perfect fit. Installing the button is as easy as twisting the OEM chrome button off with a vice grips/wrench and screwing on the Perrin one. 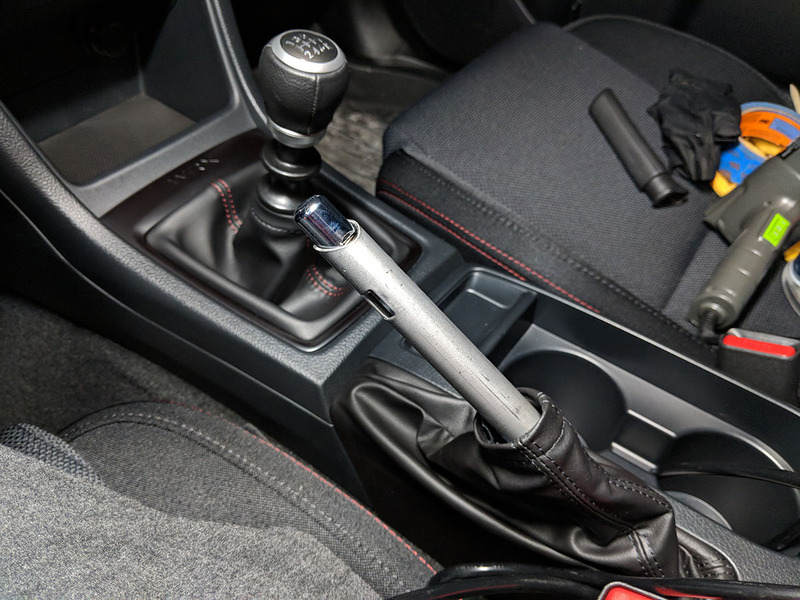 I elected to do this while I had the OEM handle off to prevent damaging the new, carbon e-brake handle. NOTE: If you’d like to keep your OEM chrome button intact, I’d recommend wrapping it with something grippy, like a piece of rubber (I used a rubber glove), before clamping with the vice grips. 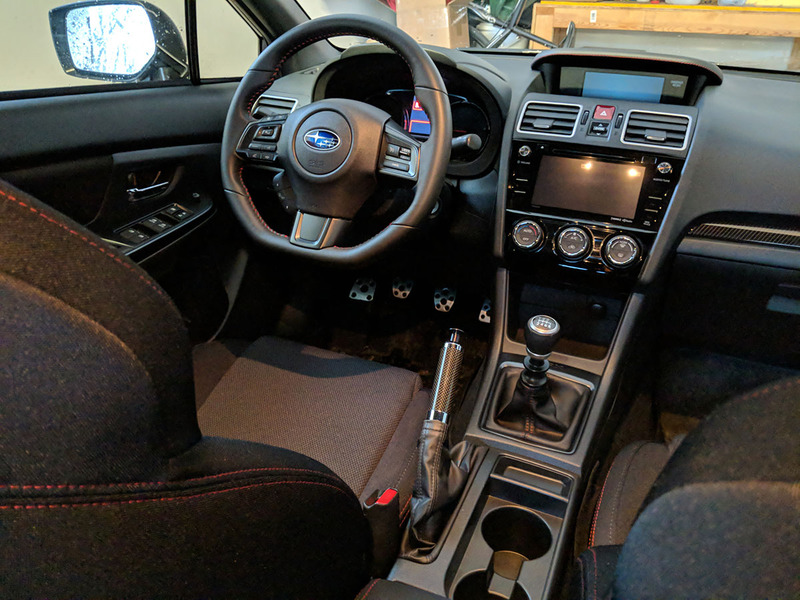 With everything installed, I’m pretty happy with the resulting look. 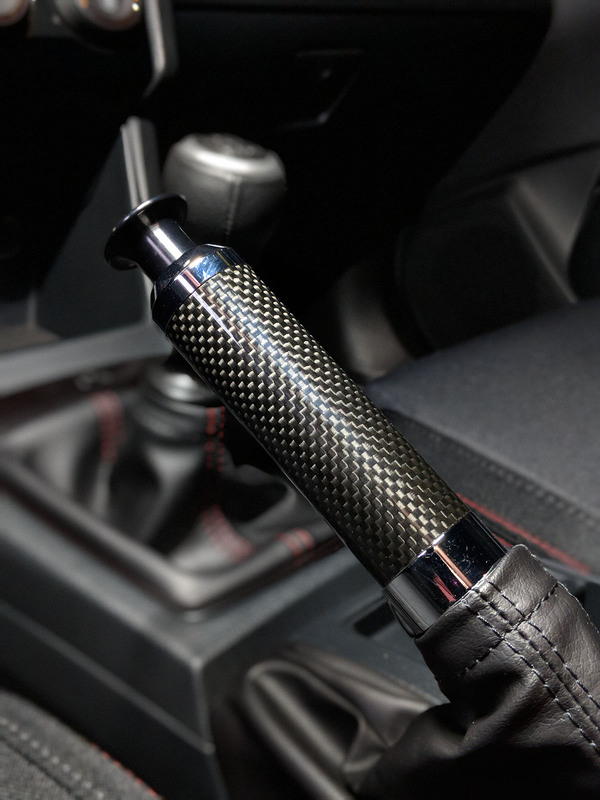 The carbon/chrome of the handle match the other interior pieces perfectly, and the anodized gunmetal of the Perrin button compliments the painted grey surfaces well too. I’m not sure I love the width of the Perrin button - it can feel a bit weird at first. I may try out a smaller button in the future, just to compare. 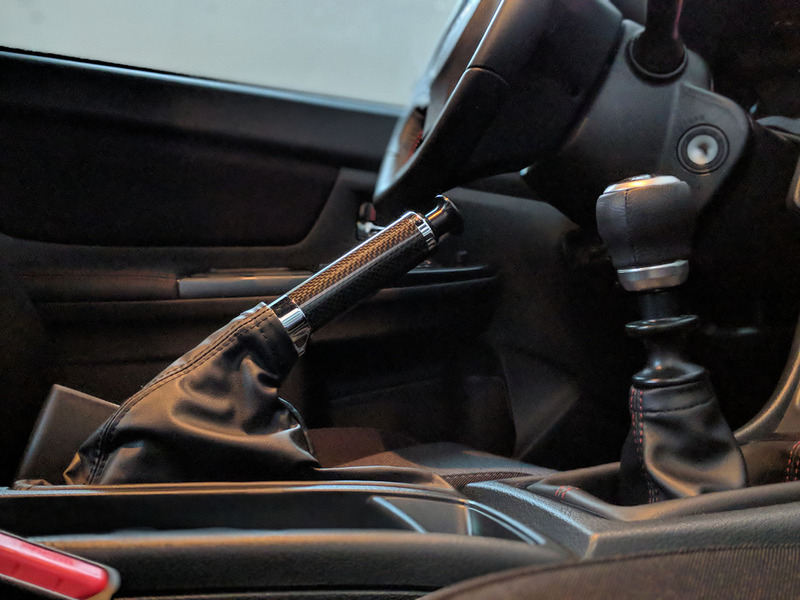 If you’d like to pick the handle/button up yourself, they can be found on Amazon here and Subispeed here, respectively. NOTE: The handle can also be found over at Subispeed, but the exact same item can be picked up on Amazon for much less!